Let your business shine bright this holiday season with Illuminight's commercial holiday lighting services. With our 22 years of professional experience in holiday lighting and electrical installation, FREE 24/7 hour maintenance, and computerized/remote control operation, we guarantee that you'll be the best on your block! Your customers are the lifeline of your business. Nothing entices and enchants them more than our custom commercial holiday lighting services. With our custom packages, you can select the perfect display that will make your businesses’ doorstep more festive, more noticeable and busier than your competitors. Roofline lighting with traditional clear bulbs or eye-catching color changing LED bulbs. Window decorations (lights, garland, frost, berries) and Rockwellesque painted glass vignettes sure to inspire the holiday cheer. Swooping Garland accented with our classic lighting arrangement and traditional attire of bow, mistletoe, chokecherries and frost. Tree lighting with Illuminight’s custom Trinity Lighting System, or our multi-Color fading lighting treatment will seize new customers’ imagination and dazzle your current customers’ imagination. Real and artificial fully decorated and installed trees of all shapes and sizes. Comes with real presents! Handsome Balsam, Cedar and Pine wreaths customized with your businesses colors, logo or insignia. Figurines, moving and non-moving Santas and all the North Pole’s favorite characters, including three-dimensional. Illuminated fuzzy and realistic teddy bears, snowmen, santas and more! Will Your Business Be The Talk of the town this year? 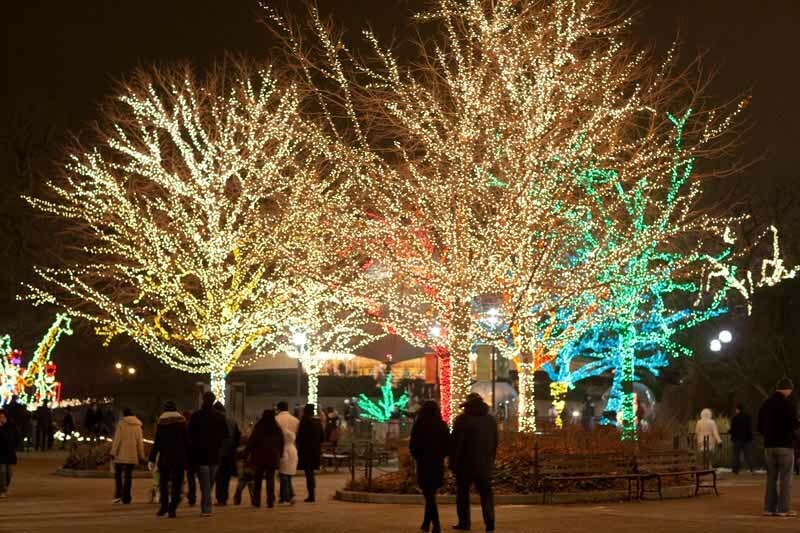 Whether we are installing new innovative holiday light displays for Zoo Lights at the Lincoln Park Zoo or decorating Chicagoland townships, we make your holiday display the best on the block! Do you need a commercial Christmas light installation company? Fill out the form below with your contact info and your holiday needs. We will be in touch shortly!